I realize that I have been bandying about the concepts of crustal shift and crustal curvature fairly freely recently, and unless you have gone back through my core article on the Pleistocene nonconformity and additional discussions sprinkled through this blog, you may be in difficulty. A little definition needs to be refreshed and perhaps tightened up. First, a crustal shift is a movement of the entire crust of the Earth as a thin one hundred mile thick or so layer of crustal material that we are familiar with as a single unit. It is a little bit like the rind of an orange on the Earth’s core. It is possible because there is a thin layer of molten carbon at the interface between the core and the crust. At rare intervals some of this carbon rockets to the surface at the rate of seventy or so miles per hour to form diamond pipes. This also confirms near zero viscosity as might also be theoretically expected from our knowledge of carbon behavior. Recall also that carbon has the highest known melting point and this is the reason it can be brought down to this depth. Once the crust is in motion this rind conflicts with the fact that the earth is not a perfect sphere, but is larger around the equator that around the poles. This ultimately acts to halt the motion rather quickly as the carbon layer get pinched off through the motion of the crust. This plausibly places an upper limit on the thickness of this unique layer. The evidence shows that the process allows a thirty degree shift from the pole itself. A natural result is to dynamically change curvature throughout the crust. In our case where the shift took place on an arc passing through the poles themselves, the maximum curvature change takes place along this arc. We can imagine curvature as a grid square associated with any point on the crust. As this square passes over various parts of the core it is either been compressed or stretched. For example, as the region of the Indian Ocean approached and rode onto the equatorial ‘bulge’ the crust was stretched. This induced a region of extensive subsidence to accommodate this stretching. Mountains collapsed and sank thousands of feet. On the other side of the equator the square became compressed and we have uplift of both the Tibetan plateau and the boundary range as a release mechanism. These examples are placed in the area of maximum activity. The same thing happened on the other side of the globe impacting the Caribbean and the Andes. 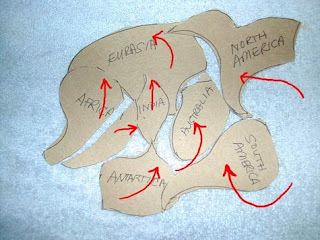 Africa was barely touched because the rotation centered there as it also did in the Pacific. It was the region of least curvature change. Approaching geography with that in mind, one can look at a given piece of terrain somewhat differently. Knowing we have a recent disturbance that is slowly sorting itself out allows us to investigate a square and map movements with a new assurance and also a new conjecture. That the event mapped may not be part of a longer term continuing process. What if certain sections of the Rockies are truly recent? It is easy to figure out what is not recent, but certain terrains are good candidates for an abrupt rising twelve and a half thousands of years ago. And I must point out an important consideration. It rocks that are millions and billions of years old got moved around just yesterday, it would still be difficult if not impossible to pin down the actual time of the event. Anything like the actual biome on top would be shattered and ground to oblivion. We really do have to find a plant trap high in the Andes or the Himalayas that can be aged. This is you must admit is a pretty tall order. Once we make the conjecture that parts of our physical world were rearranged recently, it is not too hard to sort out areas of interest. After all a suite of weathered rock that is rotted out, did not happen recently. It took plausibly millions of years of effort. Yet a few miles away one is confronted with exposed and unrotted rock. The coast crystalline range on the Pacific North West shows the most modest weathering that could be expected yet it is integral to the only temperate rain forest on Earth. Yet the range buts up against a deeply rotted central plateau that exhibits deeply rotted rocks. This region is arid been in the rain shadow of the coastal range. In truth we have largely the opposite of expectations although one could argue that the excessive rain of the coast has swept debris away. In fact we have argued that glaciation has scoured all these mountains out and the `effects of glaciation mask all this terrain. The salient point here is that a lot of disturbed terrain can be convincingly written up to support either option. And I hate to say this but a lot of geological interpretive work suffers from this characteristic.